People entering the hobby of coin collecting (and those who’ve found a coin that might be valuable) usually want to know how they can clean their coins. It seems logical to some people that a bright and shiny coin would be favored by coin collectors. While that may be true to a certain extent, what is also true is that coin collectors prefer coins that display normal, natural color. If a coin is bright and shiny because it was well preserved or just came from the Mint, that is a good thing. However, if a coin is bright and shiny because it was just dipped in vinegar and baking soda or was scrubbed with an abrasive like toothpaste, then coin collectors will shy away. Why? Again, most coin collectors prefer coins that possess natural color. It is true that, in many hobbies, a “cleaned” or “restored” item usually fetches higher prices than unkempt versions. Yes, it is often the case that a cleaned and newly restored 1957 Chevy may get a higher price than a junked version of the same car. Many times, you will hear of old paintings and linens on “The Antiques Roadshow” that appraisers say would fetch a higher price if holes were repaired and grime was washed away. However, in coin collecting, numismatists tend to take the “old, fine wine approach.” That means, they value and appreciate coins that show their age. A true coin collector would rather have a deep, chocolate brown-colored penny that is 100 years old than a penny of the same age that has been cleaned to look new. What also happens when a coin is cleaned is that it usually displays an unnatural color. 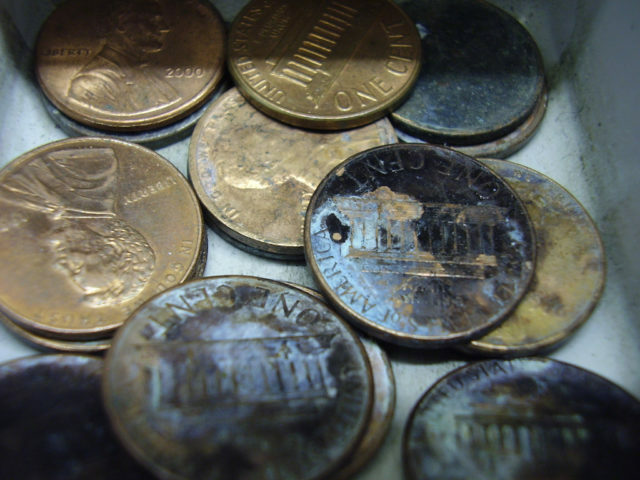 Pennies that have been cleaned often take on an unnatural, orange color. Sometimes cleaned pennies will show streaks or blotches of color. Silver coins sometimes take on uniform grey colors that are otherwise unnatural for silver coins. Any coin that has been heavily cleaned will have an unnatural, uniform reflectivity that coins would not normally show. So you’re probably wondering… what are cleaned coins worth, compared to uncleaned coins? Like many aspects of coin collecting, there is little science in valuing cleaned coins versus uncleaned coins. Many aspects of judging a cleaned coin’s value are based on eye appeal. That is, how “nice” does the coin look? A coin that has been so abrasively cleaned that it now has scratches or hairlines and has lost its luster will rarely be worth anything more than half its original, uncleaned value. A coin that has been only lightly cleaned (and is not scratched and doesn’t have much evidence of impaired luster) may be reduced in value by as little as 10% or as much as 30%. However, there is no “rule” for such values. Pricing of cleaned coins is often done on a case-per-case standard. Percentages mentioned above are the more common price discounts I have seen over the years for cleaned coins being offered from dealers. Is There A “Safe” Way To Clean A Coin? There are relatively few occasions when it is considered recommendable to clean a coin. Normally, coins that are encrusted in dirt can be safely cleaned with simple, clean water. It is usually okay for the coin to sit briefly in the water — so as to give the dirt time to gently dissolve. Pat, don’t rub, the coin dry with a soft towel. Removing loose debris is acceptable in coin collecting. The controversy about cleaning coins usually comes into play when a person is attempting to remove the natural color or patina that a coin has taken on. For example, rubbing just about anything on a coin will leave scratches and fine lines on the surface of the coin. While to the novice eye, these lines may resemble the luster and shine seen on new coins, the lines actually represent irreparable damage to the coin. Regarding pennies, all of those coin cleaning methods you’ve heard so much about — from vinegar to baking soda to erasers — actually strip away the natural toning (tarnish) that your pennies have taken years to develop. 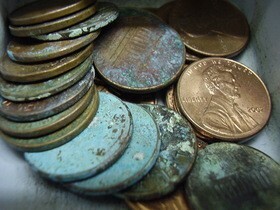 The deep browns seen on most older pennies are colors that most coin collectors actually desire. So when a penny with even, brown or chocolate colors comes your way, leave it alone! If your coin has suffered damage from polyvinyl chloride (PVC), the coin will usually have green residue on its surfaces. The green residue is a sign that the metal in the coin has begun reacting to the plastic. This reaction is usually dangerous for the coin and progressively can get worse. In time, the coin can become irreparably damaged. The chemicals involved in removing PVC can be harmful to handle and can be flammable. See how to remove PVC damage on coins. Here’s more about cleaning coins, plus links to coin cleaning products. If you must, here are specific tips for cleaning different types of coins. Here are some tips for cleaning and preserving coins.